In today's post, I want to take a moment to rave about McAlister's Deli because they are not only my favorite fast casual restaurant, but they are also dedicated to helping our communities and teachers. Teacher Appreciation Week is almost here, so let me share some great ways that McAlister's Deli is sharing love with teachers. There are three events that you won't want to miss. Details: Customers can show their appreciation for the special teachers in their community by nominating them. 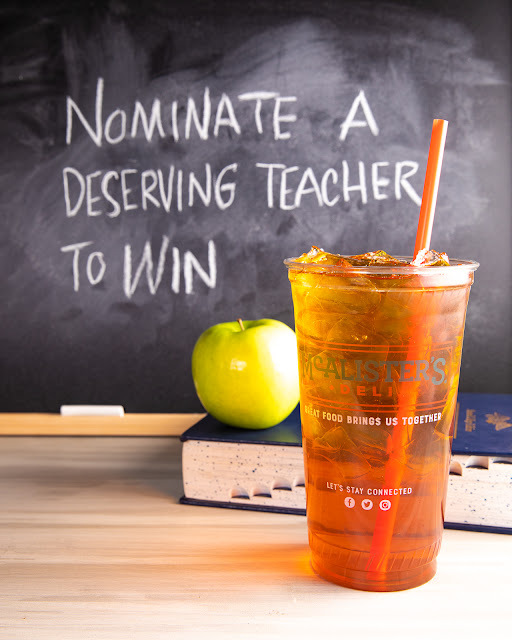 A winning teacher will be selected at every McAlister’s Deli location and will receive a monetary donation and catering for their classroom. Additionally, three national well-deserving teachers will receive $1,000 each for school supplies. To nominate a teacher, visit the McAlister’s Deli website and submit an entry explaining why they should be recognized. Details: With a valid teacher I.D., every teacher can fill up on their favorite sweet drink. Details: McAlister’s Deli is holding a nationwide Cookies for a Cause initiative where it will donate $0.75 of every sugar cookie sold to the restaurant’s local school district. As I mentioned earlier, McAlister's Deli is my favorite fast casual restaurant. They are actually celebrating their 30th anniversary this year! I think that their dedication to hospitality, sandwiches, spuds, soups, salads, desserts and McAlister’s Famous Sweet Tea™ is what has made them so popular. They are also great for our communities and serve as good neighbors by supporting community causes such as the three Teacher Appreciation Week events that I mentioned above. Finally, if you are on the PTO or part of another organization, keep in mind that McAlister's Deli also offers catering with a nice variety of sandwich trays, box lunches, desserts, a hot spud bar, and more. They have 400+ restaurants in 28 states, so there are many convenient locations. I hope that you will share this post with others as McAlister's Deli is making it easy for us to support our local schools and to share extra love with our teachers! Let's all visit McAlister's Deli, especially during Teacher Appreciation Week when they donate money from our cookie purchases through the Cookies for a Cause campaign that I mentioned above! Visit the McAlister's Deli website. Also visit them on Facebook, Twitter, and Instagram.